Chagatai Khan: Makranis, the Negroes of Pakistan and India. 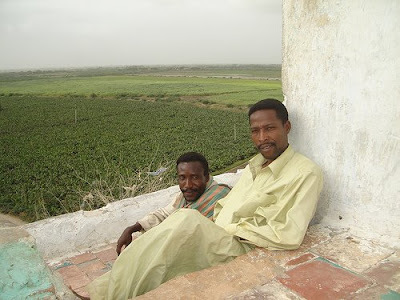 In Pakistan, locals of Black African descent are usually called "Sheedi". 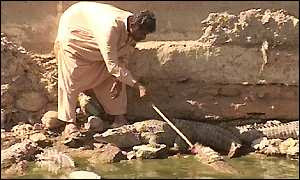 They live primarily along the Makran Coast in Balochistan, and lower Sindh. In the city of Karachi, the main Sheedi centre is the area of Lyari and other nearby coastal areas. Linguistically, Sheedis are Balochi or Sindhi. The Sheedis are believed to have arrived from East Africa in the area as slaves with Arab traders and rulers, especially via Muscat during the Omani suzerainty over the enclave of Gwadar in Makran. Famous Sheedis include the historic Sindhi army leader Hoshu Sheedi[HYDERABAD: ‘Hoshu Sheedi Day’on March 23 Bureau Report March 21, 2007 Wednesday Rabi-ul-Awwal 1, 1428 http://www.dawn.com/2007/03/21/local34.htm] and Urdu poet Noon Meem Danish[ AUTHOR: A poet in New York By Asif Farrukhi http://www.dawn.com/weekly/books/archive/071209/books6.htm]. Sheedis are also well known for their excellence in sports, especially in football and boxing. 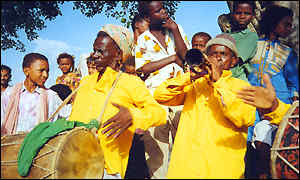 Black African style rhythm and drums. The above lines were written by a young Sindhi poet, Zulfikar Halipoto, on the execution of the South African poet Benjamin Moloise in 1985. In his reaction to the hanging of the poet-activist and his solidarity with the African people and their political movements, Halipoto was by no means a solitary voice in Pakistan. Indeed, generations of political activists, writers, and men and women of the left-leaning Pakistani intelligentsia have been influenced by political and intellectual movements from across the continent of Africa. Such solidarity with Africa in Pakistan goes back at least to the late 1950s and 1960s when, under the influence of third world internationalism in the immediate post-decolonization period, and in particular, Zulfikar Ali Bhutto who had ambitions towards becoming an important Third World leader, Pakistan began to position itself in the Afro-Asian and Non-Aligned Movements. At the popular level, however, the overthrow of Nkruma and the murder of Patrice Lumumba perhaps represent the historical period when solidarity with Africa was at its peak in Pakistan. Other such moments are the Algerian revolution, Jamal Abdul Nasser's brand of Islamic socialism and later his stand on the Suez Canal -- all these moments and more of African history have left their traces and echoes on the archive of Pakistani literature and politics. No surprise then that not only have generations of Pakistani children been named after Egypt's Jamal Abdul Nasser, but a boy in Hyderabad, Sindh, is even named after Guinea-Bissau's revolutionary thinker, Amalcar Cabral. Franz Fanon's Wretched of the Earth was first translated into Urdu under the title Uftudgaan-e-Khaak in the early 1960s, and recently (in the 1980s) into Sindhi under the title Miti Hana Manhoon. Indeed, Fanon's writings have long been a key intellectual resource for activists engaged in Pakistan's various nationalist movements from the smaller provinces against the hegemony of Pakistan's successive centrist establishments. These activists would also fondly translate and recite the poetry of rebel leader (later President of Angola) Dr. Agostinho Neto. Sindhi Adabi Sangat, a representative body of Sindhi writers and poets, also passed a resolution against the hanging of Benjamin Moloise. Interestingly, in the left and subnationalist political culture of Pakistan, Africa often appears in the context of discussions about the state, colonial or postcolonial. Indeed, in this culture (which is a sub-culture merely because of the realities of power), there is a clear perception of the similarities between the despotic African state and the state of Pakistan. Examples of this are legion. A small book by the name of Guinea Bissau Kaisay Azad Hua? (How Guinea Bissau was liberated? ), published by the Peoples Publishing House of Lahore was much discussed by Pakistani leftists for its lessons on how Pakistan itself might be so liberated from its own monstrous state. 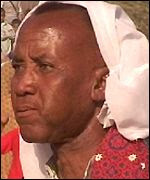 The Sindhi poet and short story writer, Ali Baba, has a story Undaho khund (literally, 'dark continent') which highlights the similarities between the nature of the oppression of his homeland, the province of Sindh, and the African continent. The parallels between the state in Pakistan and parts of Africa receive a particular acuity with every military regime. Thus, the regime of the military dictator, General Zia-ul-Haq was often compared with Mobutu and other dictators. However, it is perhaps North Africa that has understandably (given the Muslim context) had a broader impact historically on popular consciousness in Pakistan. In 1953, when Jamal Abdul Nasser nationalised the Suez Canal, students and trade unionists in Pakistan, especially in the city of Lahore, took to the streets in solidarity with Nasser. The war of independence from French colonial rule in Algeria also influenced the Pakistani political mind in general, and leftists and their intelligentsia in particular. No doubt the best known example of this is the late Eqbal Ahmad's participation in the war, working as an assistant to Fanon, and gun-running for the revolutionaries. Not surprisingly, it was the communists in Pakistan who were the moving spirit behind solidarity with Africa. Among them, the pro-Soviet Communist party (outlawed by successive Pakistani governments from 1953 to 1989, the end of the Soviet Union) and its 'open fronts' (i.e., sub-organisations in the form of student unions, intellectual forums and trade-union organisations) played a major role in it as African socialist regimes were allies of the Soviet Union. Important testimony to this connection and this route is the fact that generations of Pakistani communists and their children went to study at the Patrice Lumumba University in Moscow. Back home, Peace Camp, Movement for National Liberation, Afro-Asian Solidarity and Oppressed Peoples of Asia, Africa and Latin America were some of the organizations that represented these currents. However, the split within communists in Pakistan on the question of the 1962 Indo-China war, and later the moving apart of the USSR and China were reflected in the solidarity and support that existed for African countries in Pakistan. Many Pakistani Maoists differed with the pro-Moscow Pakistani communists on their party line on Africa. Instead, Pakistani Maoists adopted a more populist stance. Zulfikar Ali Bhutto cashed in on this populism, dyeing it in both nationalist and third worldist hues. Bhutto's brand of Islamic socialism attracted many leftists, including Malik Mairaj Khalid (who recently served a three-month term as caretaker prime minister of the regime that oversaw the elections that brought Nawaz Sharif's last government to power), who had by then formed an organisation called Afro-Asian Solidarity. They also launched an Urdu weekly from Lahore called Afro-Asia. The magazine mainly carried commentary on Pakistan's daily political life, and for the most part, its Afro-Asian solidarity was limited to its name, which was perhaps an attempt to tap into the popular internationalism of those days. It continued until Bhutto's party, which included Malik Mairaj Khalid, came to power in Pakistan following the liberation of Bangladesh, and was then later revived by the right-winger, Abdul Kadir Hassan. Under the latter's editorship, Afro-Asia published anti-Bhutto articles, thus was banned and its editor was jailed. Abdul Kadir Hassan was patronised by General Zia because of his opposition to Bhutto government. The weekly continues to be published irregularly to this day, but ironically with today's Islamic fundamentalist posture. The demise of the Soviet Union was pretty much a death-blow to the influence of African politics and radicalism on Pakistan. Today, the new linkages that are developing are determined by the pan-Islamist geostrategic calculations of Pakistan's Inter Services Intelligence (ISI). The ISI has begun to invest in 'brotherly' Francophone countries, and has begun recruiting Islamic militias there. On the diplomatic front, Pakistan's military attachés in these countries are reportedly at pains to convince their host countries of the wisdom of giving preference to Pakistan over India. Apart from the traces that Africa's anti-colonial and revolutionary writers and leaders have left on sections of the political culture of Pakistan, and the new linkages that are developing, there are more concrete, living examples of the link between the African continent and the area that now comprises Pakistan. I have in mind the descendants of the slaves brought from Zanzibar to the coastal areas of Sindh and Balochistan by primarily Arab traders. In Pakistan's largest city, Karachi, many of these mainly Baluch descendants of Africans live in the shanty neighbourhood of Lyari, also known as 'little Africa'. There is a very real consciousness among these people of their historical origins. Thus there is a street in Lyari called Mumbasa Street. At least two writers Noon Meem Danish from Karachi, and the late Muhammed Siddique Musafir, not only identify themselves as descendants of African slaves, but have also recorded the history and memories of their forefathers forced into slavery. At the institutional level, Al-Habsh (literally, 'the Ethiopian') was one of the first organizations of black Sindhis (known as 'Afro-Sindhis') established by the political activists and trade-unionist, Wali Muhammed Tahirzada, in the mid-1960s. 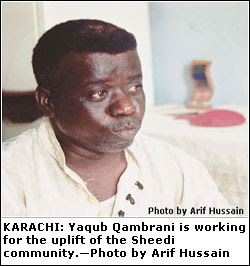 Currently, All Sindh Shidi Welfare Association founded by Faiz Muhammed Sheeddi, again a trade unionist, is an outspoken NGO of Afro-Sindhis, also known as sheeddis. Be it the extra-judicial killing by police of black youths, or their forcible evacuation from their ancestral lands and villages, Faiz Muhammed Sheeddi and his organization have been in the forefront of advocating this community's causes. Indeed, the treatment of the sheeddis in Pakistan -- an example of which is the murder in police custody of the Afro-Sindhi youth, Mashooq Sheeddi, in 1994 at the hands of the Hyderabad police -- is reminiscent of racist police brutality against black youth in the US. These communities closely follow events in Africa, and an example of both the interest and the identification is the fact that Faiz Muhammed Sheeddi and his fellow sheeddi tribesmen proudly say that Nelson Mandela has the same origins as themselves. These currents of influence -- sometimes paradoxical, even contradictory -- between the continent of Africa and the region that is now Pakistan give the lie to the self-contained vision of the nation projected by the state. Instead, they bear witness to the histories of the wretched of the earth, and their struggles for solidarity. It is high time that the third world state began to reflect these histories and these realities of power, and took on again, with more seriousness than the last time, the project of solidarity. Hasan Mujtaba is a Sindhi poet and journalist in exile from Pakistan. In 1999, he received the Excellence in International Journalism Award from the Paul H. Nitze School of International Studies at Johns Hopkins University, Washington, D. C.